Make forklift operators safer and more comfortable with this 42"W x 45.5"L clear cab cover that fits over the overhead guard of the forklift. The formed channels and gutters divert water, dirt, dust and debris from falling into the cab area. Made from rugged, weather resistant, high impact non-yellowing polycarbonate material that leaves a view clear for the driver. Whether clear or tinted, the product blocks 100% of UV light to protect the driver from long term UV exposure risks. Easy to install and remove. No tools needed. Choose from clear or gray tinting. Complies with OSHA standard 1917.43(e)(1)(ii): "Overhead guards shall not obstruct the operator's view." This product ships FEDEX Oversize. There is an added fee for oversize pkg. Orders greater than 5 units ship common carrier. DO NOT SHIP UPS - there is a $10 pick-up fee if shipped through UPS. The cab cover will have to rest on top of the lights. 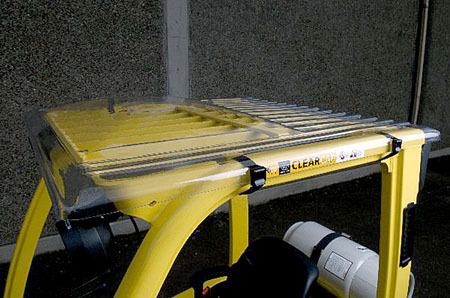 Order cab cover using actual outside front-to-back dimensions of the overhead guard and rest the cab cover on top of the lights, tightening down the restraint straps only enough to securely hold cab cover in place on lights. There is a risk of diminished effectiveness of the rain guttering and run-off channels with this solution. Telescoping Short Boom - 13"H, 94-3/8"L, 4,000 lb. Cap.